President Trump has nominated David Bernhardt to be the next secretary of Interior, to replace Ryan Zinke. Bernhardt was second-in-command under Zinke, and has been acting secretary since Zinke resigned amid ethics complaints. Zinke, a former Navy seal, made for a showy frontman for the department. That was clear from Day 1, when he rode a horse to Interior headquarters in downtown Washington, D.C. Zinke had a big persona, and a big cowboy hat to go with it. Bernhardt, by contrast, is a dark-suited attorney with a sharp mind for natural resource law and policy. He previously worked as a lobbyist, representing several energy companies. He also represented the state of Alaska in 2014 in an unsuccessful lawsuit seeking to conduct seismic testing in the Arctic National Wildlife Refuge. 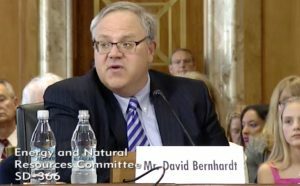 Bernhardt is an enthusiastic supporter of oil development on federal lands and waters, including in the Arctic. When Bernhardt took the deputy secretary job, he agreed to recuse himself from matters involving more than two dozen of his former clients. That list did not include the state of Alaska, and the recusals expire by early August.